Leicester City manager Claude Puel says it is time to “restore all focus on football” as they move on from the death of their owner. The Foxes have played two emotional games since Vichai Srivaddhanaprabha and four others died when his helicopter crashed following a 1-1 draw with West Ham. “Our tributes for the chairman are in our minds but now it is important to speak about football,” said Puel. Leicester visit Brighton on Saturday. Puel thinks the international break came at the right time for the club. 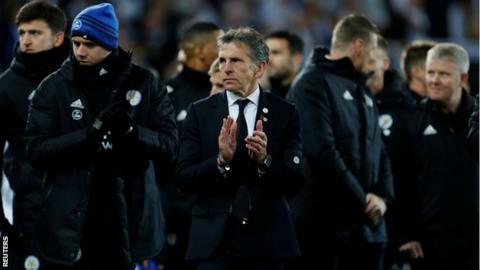 “It was a good thing for us, for some players, for their bodies, their minds and for the international players – it was important to have this,” Puel said. The Foxes are 10th in the Premier League after a 1-0 win at Cardiff and 0-0 home draw with Burnley following the tragedy.